Note: This is for educational purposes only. Diagnosis and treatment, which should only be handled by a licensed professional, is not implied or intended. Why is winter cold and flu season? So what can you do to avoid the misery of colds and flus? 1. Make it a point to get outdoors into the fresh winter air regularly, exercise (walking is fine) and get sun on your skin. It’s a simple formula: Exposure to nature will strengthen you. Being cut off from it will weaken you. Great news: Some great tasting “holiday” treats like cinnamon, nutmeg, ginger and even molasses are good for you. White sugar, white flour, butter and the things made from them not so much. Also, if you haven’t yet discovered the health benefits of naturally fermented foods like natural (not factory-faked) sauerkraut, now is a great time to explore these amazing foods. Sandor Ellix Katz is one of the best authors on this subject. More and more, health foods are carrying the real thing. Just a forkful a day makes a huge difference in digestion and circulation which strengthen your immune system. This is an entirely natural way to add probiotics to your system. You can also buy probiotics by the capsule. If you do, get the shelf-stable variety and check the expiration date. Long story short, you have no idea how consistently refrigerated the refrigerated varieties are so why pay extra for them? Does it make sense that pharmaceutical companies can manufacture an immunization shot months in advance for a specific seasonal disease that hasn’t even manifested yet? Also do you really want a manufactured product with biological elements from dubious sources injected into your bloodstream based on the self-serving “science” of Big Pharma? Note: In the US, two of the most advertised products in the winter are fast food restaurants and flu shots. Is there a connection? 6. When you’re starting to feel under the weather, catch it early. The old saying “a stitch in time saves nine” applies to heading off colds and flus. If you’re tired, rest. Sounds obvious, but in our caffeine and adrenaline fueled society we can miss this basic clue. 7. There are herbal remedies for flus and colds and also ways to prevent them from developing, but prevention is far better than a cure and all the herbal assist in the world can’t overcome unsound habits. A lot of people have heard that echinacea is great for colds and flus and tried it and not gotten good results. Very simple. They’re either using the wrong form and/or they’re not using it correctly. Note: Like just about every substance on earth echinacea has the potential to create an allergic reaction in certain people. If you are allergic to ragweed, chrysanthemums, marigolds, and/or daisies or if you have asthma or atopy (a genetic tendency toward allergic reactions), proceed with caution with this plant. That said, echinacea is one of the most commonly used plant medicines to bolster the immune system when it is under the stress of a cold or flu. 1. Keep echinacea tincture in stock at home at all times and when you travel bring it with you. 2. The phytochemicals in echinacea that boost immunity are both water and alcohol soluble so an alcohol tincture is the way to go with this plant – NOT tablets, capsules, teas or glycerin extracts. There is no particular need or benefit for echinacea to be mixed with anything else. You sometimes see echinacea and goldenseal together. Not necessary. Goldenseal is a wonderful plant, but it is endangered due to over harvesting and loss of habitat. Hold goldenseal in reserve for situations where you really need it and if you do need to use it, take it for no more than ten days and then rest from it. b. Use echinacea only when you need it, not all the time. It’s not a tonic to be used every day because its effects diminish with use. You need to “rest” from it for its therapeutic qualities to reassert themselves after you’ve been using it for a while. Therefore, taking it every day to prevent a cold is bad idea. One exception to this rule is if you know you’re going to be exposed in a prolonged way to an unhealthy environment like an airplane flight or if every kid in school (or every colleague at the office) is “coming down with something.” Then some preventative doses make sense. Read the following carefully. It addresses the single most important thing you need to know about how to use echinacea effectively. My guess is not 1 person out of 100 who uses echinacea knows this. 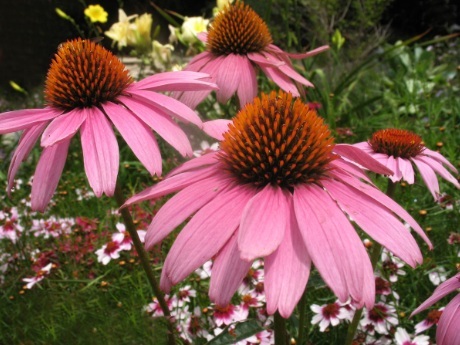 For echinacea to be effective, it must be used in a scheduled way. Small doses of tincture every two hours. For adults, if you feel a cold coming on, the first dose is one teaspoon diluted in a small amount of water. For adults, after your first dose take 1/2 a teaspoon every two hours. Keep the tincture by your bed to take if you wake up at night. All medications, herbal or pharmaceutical, have optimal dosing schedules. Herbs take time to “kick in” and before the effect of one dose declines, so you want to introduce the next one so that it “kicks in” as the effect of the previous one is on its way out. To use a crude analogy: You want to stay continuously “high” on echinacea long enough so that it can do its thing, but you want to be as efficient in your dosing as possible – not too much and not too little. A modest dose every two hours is one recommended way to achieve optimal results with echinacea. As a rule of thumb, more is NOT better. The right sized dose at the right time is the best sized dose. If the cold takes hold and symptoms appear continue taking it every two hours for a day or two and then switch to one teaspoon three hours a day for a few days. Then take a break from it. There’s no hard and fast rule, but you do need to take a break from echinacea in order for it to work with maximum effectiveness. Some say “five days on, two days off”. Others say “ten days on, three days off.” The key is you can’t be on it continuously because it loses its effectiveness. You need to rest from it. The most important thing is to start the treatment when the illness is in its very early stages so you can knock it out before it takes root. Echinacea is for healthy people who are coming down with cold and flu symptoms. It is not suitable for people with serious illnesses like tuberculosis or auto-immune disorders such as lupus and multiple-sclerosis. For some unknown reason human beings are not good at making Vitamin C.
Normally our Vitamin C making limitation is fine, but when your body is challenged in some way with illness or toxins, Vitamin C is a wonder drug and when you need it, it would be great to get as much of of it as you can. The problem is if you take a standard Vitamin C tablet, you’re only likely to absorb 5% or maybe 10% of it if you’re very lucky. So a 1000 mg. tablet only gets you 50 or 100 mg. However, there is a method of processing Vitamin C called liposomal encapulation which delivers the entire 1000 mg of a 1000 mg. dose. Doses cost about $1 each, much more than a standard Vitamin C tablet, but given that they deliver 10 to 20 times more usable Vitamin C than a 1000 mg tablet, it seems like a good value to me. The company that is pioneering this field is called LivOn laboratories. You can research them on the Internet. Note: There is an Internet hoax supported by several videos that says you can make your own liposomal encapulated Vitamin C at home. You can’t. This is an area where it pays to buy from an expert manufacturer. Modern homeopathy was first standardized in the 18th century by Samuel Hahnemann. Until the 20th century and the ascendancy of Big Bank-funded medicine, it was a widely used medical system in the US. There’s no time or space to give a homeopathy course here, but here’s a little known homeopathic “trick”: Muco coccinum. It’s made in Canada, but you can easily get it on the Internet (Amazon sells it) and it’s a homeopathic medicine. If you feel you’re coming down with something take a tablet two or three times a day for a day or two. If that doesn’t work, you can switch over to echinacea. Now you know some simple health habits to follow to strengthen your system against the onslaught of cold and flu season. It’s no fun being sick and many time it’s simply not necessary. If you catch a cold or flu every year, or some years, it’s very possible to prevent them or if they do start to breach your defenses stop them in their tracks. Sun, fresh air, exercise, avoid bad foods, seek nourishing foods, wash your hands regularly, avoid touching your face during the day and be ready to take helpers and know the right way to use them.